From a fantasy (especially dynasty) perspective, this year’s running back draft class is drawing very little buzz, and it’s not hard to see why. The majority of running backs to test at this year’s combine underwhelmed athletically, and dramatically so. Among all drafted running backs to participate in the combine since 2000, the average speed score is 103.6, while the average agility score is 11.25. This year, only five running backs surpassed a speed score of 103.6: Ryquell Armstead, Mike Weber, Justice Hill, Jordan Scarlett, and Miles Sanders. Only three bested an 11.25 agility score: Alex Barnes, Miles Sanders, and Dexter Williams. Still, despite testing poorly, there is one metric that should leave us somewhat optimistic regarding this year’s class: missed tackles forced. Missed tackles forced is a more accurate representation of a running back’s skills once the ball is in their hands and independent of team blocking. Three running backs from this class were especially strong by this metric. 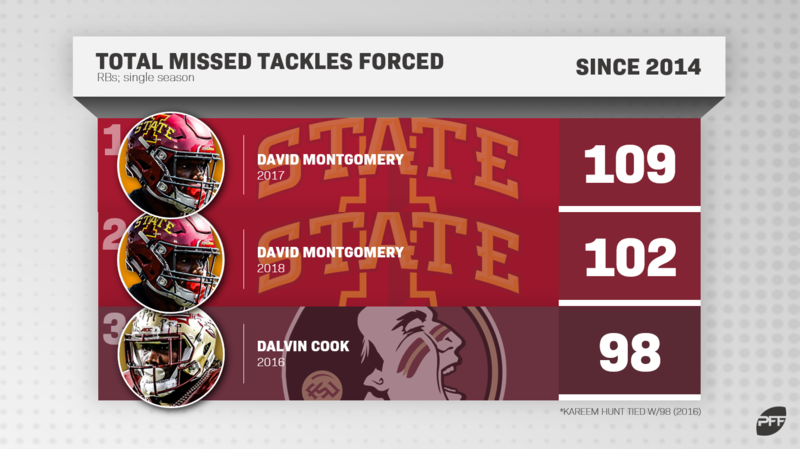 Keep an eye on David Montgomery, Devin Singletary, and James Williams in the analysis below. Since we began tracking college players in 2014, only twice has a running back eclipsed 100 missed tackles forced in a single season. Both times it was Montgomery, in 2017 (109) and 2018 (102). The previous record was a tie between Kareem Hunt (98) and Dalvin Cook (98), set in 2016. Ranking fifth-best is Devin Singletary in 2018 (93), followed by Leonard Fournette in 2015 (95), and then Singletary again in 2017 (93). James Conner, Rashaad Penny, and Royce Freeman all have top-12 seasons by total missed tackles forced. Derrick Henry, Christian McCaffrey, Kenneth Dixon, Saquon Barkley, and Melvin Gordon also hold seasons in the top-20. Clearly, among such elite company, this looks encouraging for the fantasy draft stocks of Montgomery and Singletary, despite their more pedestrian combine numbers. However, raw missed tackles is a counting stat and doesn’t necessarily speak as much to efficiency as missed tackles forced when on a per-touch basis. Notes: Running backs playing in a Power-5 conference are listed in bold. Looking at all college running back seasons (min. 150 touches) by missed tackles forced per touch since 2014, you’ll notice Montgomery again ranks first and second. Williams owns seasons ranking third-, fifth-, and seventh-best. Singletary (fourth-best) and Darwin Thompson (sixth) are also both draft-eligible. Only two of the remaining eight running backs went undrafted, while four have already proven especially value for fantasy football. Hunt and Barkley were first-round fantasy picks last year, Conner will be a first-round pick this year, and Cook is likely to be drafted as a top-12 fantasy back this year. Among all Power-5 running backs with at least 200 career touches (and who are draft-eligible this year or who have already declared), Williams ranks first in career missed tackles forced per touch (0.35), followed by Montgomery (0.35), and then Alvin Kamara (0.32). All of Cook, Joe Mixon, Barkley, Chris Carson, Jonathan Williams, DeAndre Washington, T.J. Yeldon, and C.J. Prosise also rank top-20. Among all non-Power-5 running backs under the same conditions, Singletary ranks third-best in career missed tackles forced per touch (0.29), sandwiched in between Dixon and Hunt. Although Josh Jacobs (ADP: rookie RB1) is our top running back in this class, and thus should probably be the first running back off the board in dynasty rookie drafts, Williams (ADP: rookie RB13), Montgomery (rookie RB2), and Singletary (rookie RB5) all offer massive sleeper appeal. Williams is especially intriguing given his strengths as a receiver – he leads all combine-invite running backs in receptions (by 132) and receiving yards (by 673) over the past three seasons. Remember, targets are worth 2.74 times as much as a carry in PPR leagues. However, that might also be skewing our numbers here. The data suggest it’s easier for a running back to force missed tackles on catches than carries (29.6% easier), so maybe we should take his ranking with a grain of salt. Or, maybe not. Williams holds three of our top-10 seasons by missed tackles forced per reception. Kamara, McCaffrey, and Hunt have seasons ranking in the top-five, while Montgomery’s 2017 season actually ranks first. However, Williams has also been exceedingly efficient on the ground. In terms of missed tackles forced per carry, among all 881 qualifying 100-carry seasons since 2014, Williams’ 2016 season ranks fourth-best, his 2018 season 24th, and his 2017 season failed to qualify. For his career, and only as a runner, Williams was brought down on first contact only 43.7% of the time, which ranks best of 369 qualifying running backs since 2014. Montgomery is probably the clear No. 2 in this draft class (after Jacobs) from a fantasy perspective. His numbers over the past two seasons are unparalleled, and unlike Singletary, he did it against much tougher competition. Montgomery also benefits from added receiving upside. He ranks second among combine-invite running backs in receptions over the past two seasons (58), well above Singletary (26). I should also note, both Montgomery and Singletary (and unlike Williams) are exceptional pass-blockers. Of over 350 qualifying running backs, Montgomery ranked fourth-best in pass-blocking grade in 2017, while Singletary ranked second-best last year. This should help both get on the field and produce immediately at the NFL level. Based on the contrast between our best ball rankings and current best ball ADP, all three running backs look like strong values. Earlier this month, I argued that would likely be the case (and why) here. After everything said so far, note that some of these (admittedly very impressive numbers) could be skewed by a scheme that is more conducive toward forcing missed tackles, or perhaps a specific runner is strong at forcing missed tackles but poor at hitting an open hole. This is why the PFF Draft Guide (out now and continually updated) is my primary resource when it comes time to rank rookies for dynasty and best ball leagues.